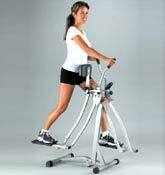 Workout in comfort anytime with the Koolatron Elliptical Strider. It provides both an upper and lower body workout in one complete package. No more waiting in line for equipment at the gym! It folds away for easy storage. Folds away quickly for easy storage.